Mr. Tanen and his ties are back! But now there's trouble. Mr. Tanen's school has run out of funds for the long-awaited playground. He needs to raise money--fast. But how? Then Mr. Tanen remembers the words of Mr. Apple, his boss, "I wish our bank account was as full as your tie closet." "That's it!" shouts Mr. Tanen. 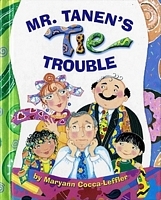 And the next day, the entire town is plastered with signs that read "Mr. Tanen's Tie Auction."